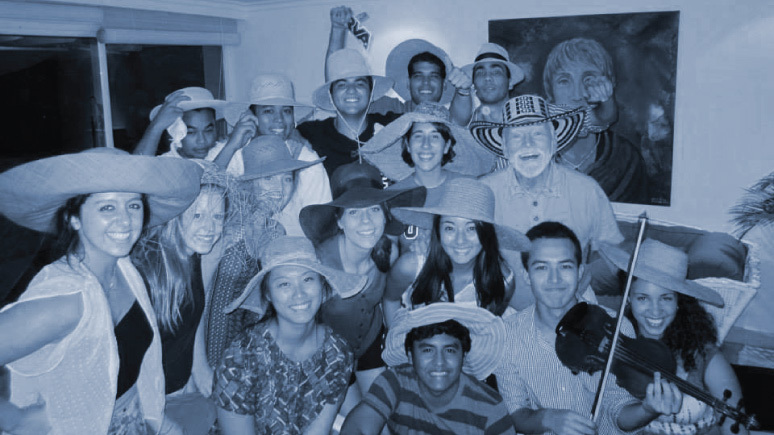 Nine music students from the University of Richmond will spend a week in Cartagena, Colombia, to perform several small chamber music concerts and participate with Colombian students in a gala concert as part of the 2013 Cartagena Festival of Orchestras and Youth. Led by faculty members Joanne Kong and Alexander Kordzaia, the UR group will deliver donated musical instruments and supplies contributed by Richmond-area musicians, as well as give lessons to young Cartagena musicians. It will also be a chance for Richmond students to perform in an international setting and build cultural understanding through musical expression. The trip was organized by Richmond-based Fundacion Tocando Puertas Para Abrir Futuros, or Knocking on Doors to Open Futures Foundation, a nonprofit group founded by Evelia Gonzalez Porto, a former commissioner of the Virginia Commission for the Arts. Alice, ’16, violinist, from Los Angeles, Calif., started studying the violin at the age of 5. She participated in the Valley Christian Youth Orchestra for six years and later became the concertmaster of the Open Academy Youth Orchestra. She has performed at the House of Blues on Sunset Boulevard, as well as Zipper Hall at the Colburn School of Music. She is double majoring in biology and healthcare and society with a minor in religious studies. She plans to attend medical school after college. Participating in a Q and A with students at Belles Artes University. We are in the news! A large article appeared this morning in the El Universal. Katherine, ’15, flutist, from Kenilworth, Ill., began playing the flute in fourth grade to complement her eight years of experience in piano. Currently, she studies both flute and piano and participates in the University’s symphony orchestra, chamber ensembles, and jazz ensemble. She is double majoring in chemistry and music and plans to attend medical school to pursue a career in pediatric medicine. Audrey, ‘15, harpist, from Moorestown, N.J., began studying the harp at age 12. She has been a member of the American Youth Harp Ensemble since 2005, and has performed in London, the U.K. and Vienna, as well as Carnegie Hall in New York City, the White House, and the Kennedy Center for the Performing Arts in Washington, D.C. She currently studies harp and is a part of the University’s symphony orchestra and chamber ensembles. She is majoring in biochemistry and molecular biology and minoring in music, and plans to attend medical school after college. We finally made it to Cartagena late last night. As we traveled through the city, everybody was astounded by its beauty, even in the dark. This morning, I woke up to the view of the Carribean right on the other side of the fence behind our apartments. I can't wait to start this adventure in what is truly paradise! We're all boarded on the plane and ready to leave cold and rainy Virginia for hot and rainy Colombia! I'm so lucky to be going on this trip with such a talented and fun group of people. We left Richmond at 3:00 this morning but we're all still so excited and in good spirits. Now on to Panama City and then Cartagena later tonight! The Cartagena Preview Concert last night was great! I can't wait to do it all again next week in Colombia! Leslie, ‘15, violinist, is a dual citizen of the U.S. and Japan, but spent most of her life in China. In 11th and 12th grades, Leslie was accepted into the Association of Music for International Schools and traveled to Frankfurt, Germany, and Beijing to play in an orchestra comprising international students from Europe and Asia. Currently, she studies violin and is the assistant concertmaster of the University Symphony Orchestra. She is a double major in environmental studies and international studies with a minor in Chinese studies. Emily, ’14, double bassist, grew up in a musical family in Lancaster, Pa., where she studied piano and string bass, and sang with her four sisters. She performed in county, district, regional and state orchestra festivals her senior year. She currently pursues music as a hobby, playing bass in the University Symphony Orchestra. She is majoring in Spanish and spent eight weeks in Guatemala this past summer. She hopes to be a Spanish-English interpreter. Emily catching up with folks back home during our long layover in Panama. Cristina, ‘14, violinist, from Petersburg, Fla., is majoring in biochemistry and molecular biology, with a health care and society minor. She currently sits as third chair in the University Symphony Orchestra. Cristina hopes to go to medical school after a gap year working abroad with a nonprofit fellowship in global health. She is a free spirit who loves the outdoors, yoga, art, spirituality, and philosophy. Lauren, ’15, oboist, from Roanoke, Va., first picked up the instrument at age 11. Currently, Oddo is the principal oboist of the University Symphony Orchestra, participates in the University’s chamber ensembles, and studies under the Richmond Symphony's principal oboist, Gus Highstein. She is a psychology major with minors in music and women, gender, and sexuality studies. She is currently conducting psychological research at the University and plans to pursue a career in psychology. Rebecca, ‘16, violinist, from Saint Louis, Mo., began studying violin at age 9. As a member of the Marquette Symphonic Orchestra, she has performed in venues in Chicago, Toronto, New York, and Washington D.C., and served as both assistant concertmaster and principal second violin from 2008 to 2012. She is a member of the University’s symphony orchestra and chamber ensembles. She plans to major in history and attend law school after she graduates. Kevin, ‘16, cellist, from New York, N.Y., first picked up the cello at age 3 and pursued instruction under the Suzuki Method. In fourth grade, he joined his first chamber group, a quartet that played together for eight years and performed at Carnegie Hall. Currently, he studies cello and is a part of the University’s symphony orchestra and chamber ensembles. He is majoring in business administration and minoring in philosophy, and plans to go to law school after college. Morning rehearsal at the apartments. We have traded in our sandals for boots, pulled out the winter sweaters, and started thinking about exams and the holidays. We may be back into the normal rhythm of our lives, but Cartagena is not far from our hearts. Since returning from Colombia we have experienced the beginnings of a true cultural exchange. A brass quintet from Cartagena, Unibrass, visited the University in early November and we did our best to reciprocate the generosity shown to us on our trip. Looking to the future, we hope to return that favor further by hosting six students from Cartagena in the spring. A student-initiated fundraising campaign is underway to help with this project so that the sharing of music, ideas, and culture can continue.